Introduction: One concern with the single incision technique for cholecystectomy is that inferior retraction and triangulation could cause injuries of the common bile duct. One method of minimizing the chance for a missed CBD injury is to employ routine cholangiography. There are no reports in the literature of routine cholangiograms being performed with SILS cholecystectomy. We present our results from thirty cases in which routine cholangiogram was attempted. Methods: Operative records and follow-up data from 30 patients undergoing SILS cholecystectomy were retrospectively reviewed. The SILS port (Covidien, Norwalk, CT) was utilized along with roticulating instruments. Percutaneous sutures were placed through the gallbladder for retraction. In some cases, additional retraction was needed and one or two 2mm graspers were inserted in the right subcostal space. Cholangiogram was attempted in all patients utilizing an Olsen clamp introduced through the SILS port. Operative data reviewed were: Patient demographics, BMI, indication for surgery, operative time, need for conversion or placement of additional ports, whether or not the cholangiogram was successful, time to perform the cholangiogram, and results of the cholangiogram. Follow up data reviewed were: length of stay, time interval to follow-up, length of narcotic use, days to return to normal activity, wound evaluation (healed, infection, hernia). Patient demographics: 23 female, 7 male. Average patient age 50 years, average BMI 31. Indication for surgery: Biliary colic with gallstones (26/30), biliary dyskinesia (1), acute cholecystitis (2), gallstone pancreatitis (1). Operative data: Average operative time was 94 minutes (range 70 to 170 minutes). Cholangiogram was successful in 28/30 patients. Both unsuccessful cholangiograms were attributed to inability to cannulate the small cystic duct. Two cholangiograms demonstrated choledocholithiasis. In one of these patients the duct was cleared with transcystic passage of a Fogarty catheter; the other patient required ERCP. Average time to perform the cholangiogram was 15 minutes (only recorded in 8 cases). Accessory graspers (2 mm graspers) were used in 10/30 cases. 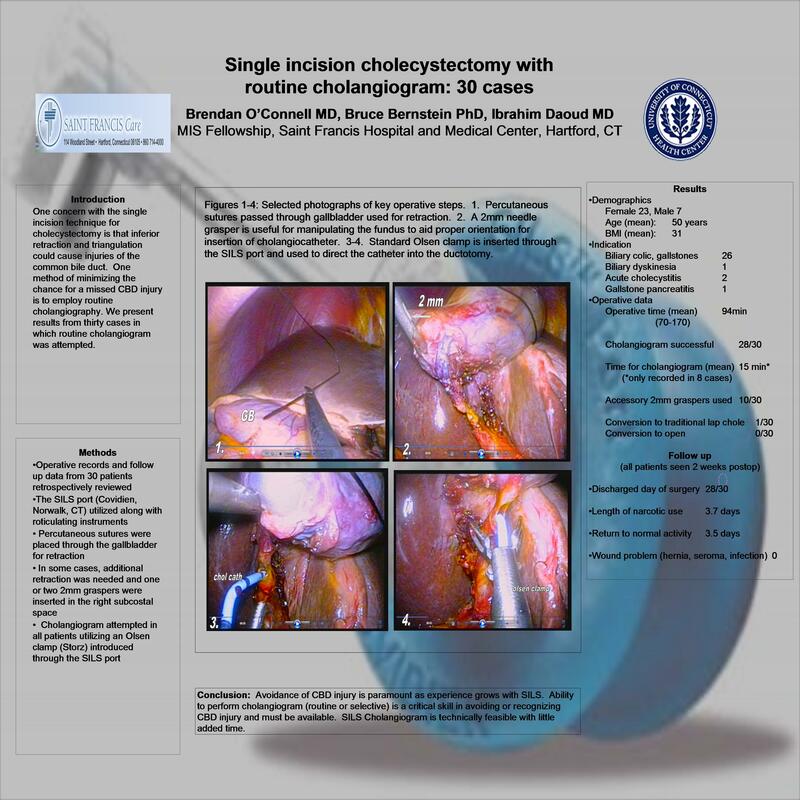 Conversion to traditional laparoscopic cholecystectomy was required in 1/30 cases. No conversions to open procedure. Follow up: Most patients were discharged the day of surgery (28/30). All were seen 2 weeks postoperatively. Average length of narcotic use was 3.7 days and average return to normal activity was 3.5 days. All wounds were well healed with no seromas, hematomas, or hernias. Two patients had erythema surrounding the incision which was treated with antibiotics. Conclusion: As experience grows with SILS cholecystectomy, it will be important to monitor the safety of this operation compared with traditional techniques. Most importantly, the avoidance of any common bile duct injury is paramount. The ability to perform cholangiogram, whether routinely or selectively, is a critical skill in avoiding or recognizing CBD injuries and must be available. We have found that cholangiogram during SILS is technically feasible with minimal added time. The use of small 2 mm graspers as an adjunct to the usual graspers and retraction sutures greatly enhanced our ability to complete the operation safely in a number of cases without a significant scar.